See the attached for a list of GWS Spring 2015 courses! BLACK LIFE MATTERS: Scholars, writers, artists, activists, policymakers, and community members will come together in Tucson, Arizona, in January 2015 to discuss WHY Black life matters and WHAT can be done about sustained racialized state violence. Check out http://www.blacklifemattersconference.com/ for more information and to register for the free conference. See the attached poster for a list of GWS summer courses, or check out the link HERE for summer course flyers! Check out this link to watch a video of GWS PhD students thanking WOSAC for their support! Click here to view our Spring 2014 Newsletter! 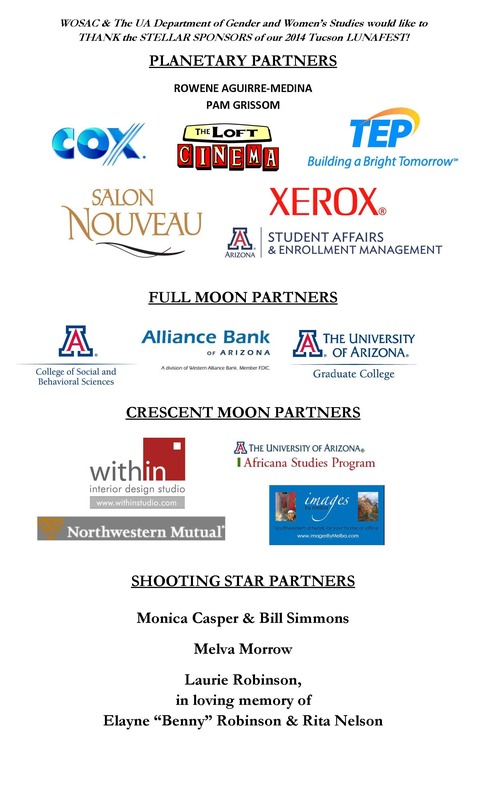 Thank you to our LUNAFEST 2014 Sponsors! Visit azpm.org for more details and also tv.azpm.org/schedules for a complete list of broadcast dates and times. Many of the program listed below have encore broadcasts on multiple channels throughout the month of March. View job talk posters for all seven candidates! All job talks are free and open to the public. Please contact coe@email.arizona.edu with any questions.